Make sure your mortgage leaves room for living, saving and giving. Your Thrivent Wise Mortgage™ is the amount we’ve calculated, and recommend you spend on a home. While you may qualify for a bigger loan, this amount would allow you to use part of your income for other things that are important to you, such as saving for retirement and giving back to your community. These interactive calculators are not intended to provide or replace specific professional financial advice. We cannot and do not guarantee their applicability or accuracy in regards to your individual circumstances. All examples are hypothetical, are for illustrative purposes only and may differ from more in-depth analysis results. They do not represent the past performance of any specific product, nor should they be viewed as a promise of future results of any product offered by Thrivent federal Credit Union or its affiliates. We encourage you to seek personalized analysis regarding all personal finance issues. 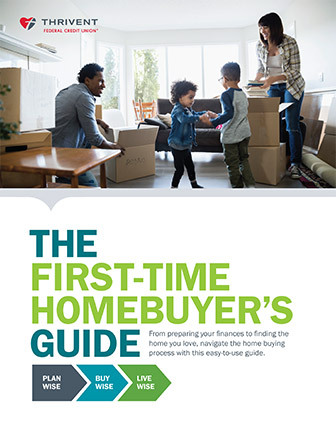 Let’s connect about your home buying journey. Learn the ten steps to buying a home wisely. Now that you know your Wise Mortgage, see the steps you should follow to get from today to move-in day with confidence. Get in-depth advice and tips about buying a home wisely. Download our FREE guide now. Thrivent and Thrivent Federal Credit Union help Christians at each stage of their Wise With Money Journey, including being wise with mortgages. © 2019 Thrivent Federal Credit Union. All rights reserved.